Gridlife has come and gone and one of the biggest highlights was definitely Radwood. We'll have a little gallery up soon, but suffice it to say dang near everything there was right in our wheelhouse. The oddballs, weirdos, under-appreciated, and plain jane right along side 80s and 90s childhood bedroom poster fodder made for the perfect contrast. A couple of the standouts had to be the pair of trucks Japanese Direct Motors posted up at the entry gate - a Nissan Safari Fire Truck and turbo'd '91 HZJ73 Toyota Land Cruiser. The pair turned just as many heads as the Safari Porsches that were parked just across the entryway, which is understandable with the Nissan draped in a fire engine red almost too powerful for cameras to accurately capture. 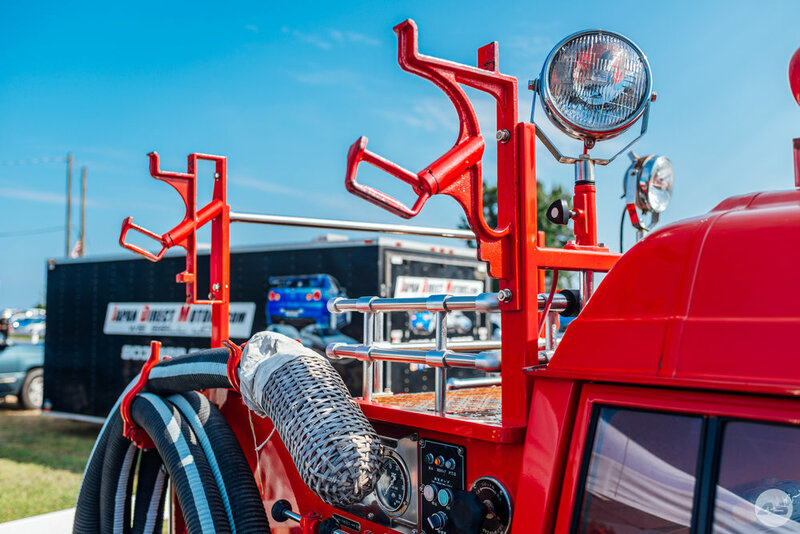 As soon as the owners hopped out and wiped them off we gathered round to take in all the neat details and mods on both rigs. As more and more GTRs, Silvias, and all manner of RHD dream cars pour into the states, it's cool to see the less mainstream imports get just as much love from show-goers. If you look closely, you can see a couple of the lime green JDM koozies on the dash - leftovers from the previous night when the owners drove through the rows of tents throwing them out to Gridlife campers. 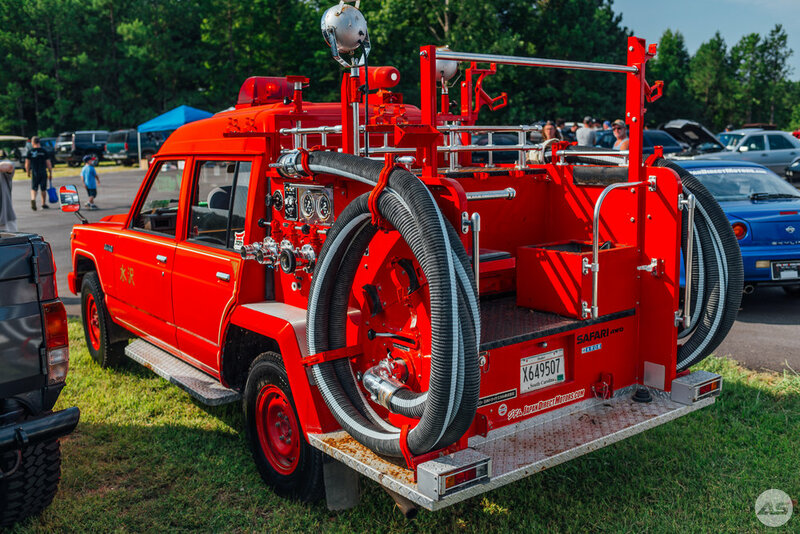 The details on the back of the truck were just as neat - certification plaques, hose hookups, the protective basket on the end of the hose, and more were all in-tact and good to go. And here's a last few details because why not. The Land Cruiser was a little less neck-breaking, but absolutely no less impressive. For instance, the rad KRD Racing Diesel carbon fiber hood that nearly blended into the gunmetal paint of the quarter panels surrounding it. Or the half-cab conversion with a roof spoiler. The exterior loadout wraps up nicely with a brush guard, Warn winch, safari snorkel, and chunky 315/75 R16 Maxxis tires. Inside the cab are a couple AAR racing seats (somehow managed to miss getting a photo, whoops) but here's a photo of the Nardi steering wheel and 90's as heck dash layout, which is almost as neat. The last little detail was spotted by Lee Purvis, a decal under the front of the truck we absolutely loved. It's pretty easy to see why these were RADwood material, but be sure to check out Japan Direct Motors on Instagram for even more 80s and 90s JDM goodies.